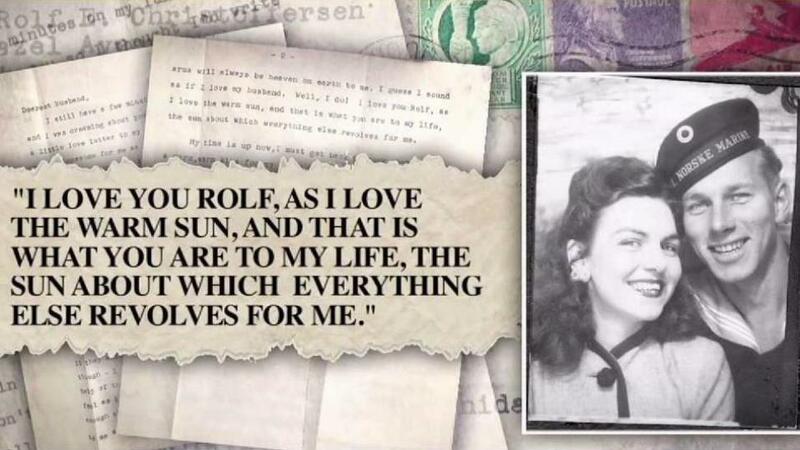 A love letter written by a World War II veteran's late wife more than seven decades ago was found in the cracks of a New Jersey home this month and returned to him. Michael George reports. A love letter lost for decades in the dusty walls of a New Jersey home has finally reached its recipient, a 96-year-old man who was a sailor in the Norwegian Navy when it was written. The letter was penned by the man’s late wife, who died six years ago this weekend. It makes the meeting of this long-lost letter and its addressee all the more poignant. “In a way, I guess it’s his wife coming back and making her memory alive again,” Melissa Fahy said. Fahy and her father Al Cook discovered the letter as they were renovating her new home in Westfield. It was in a gap under the attic stairs. The letter, postmarked May 1945, had literally fallen through the cracks. “Look at the crack. It fell down flat underneath there,” Cook said, pointing to the crevice the letter had somehow slipped into all those years ago. That’s where the letter sat for more than seven decades. It was written by a woman named Virginia to her sailor husband Rolf Christoffersen, who was serving alongside the allies overseas as a Norwegian Navy sailor. Fahy was so touched she decided to find Virginia and Rolf and deliver their letter. She posted on the Westfield Moms Facebook page for help. Just two hours later, members of the page had tracked down Virginia and Rolf’s son in California. “He couldn’t believe that I reached out and tried to find him and return the letter that belonged to him,” Fahy said. Rolf’s son read him the letter written by his late wife. It was a message of love hidden away in this old home for 72 long years.